In Abidjan, Ambassador Anatolio Ndong Mba of Equatorial Guinea, Council President and co-lead of the mission to Côte d'Ivoire, centre left, meets with the Minister of Foreign Affairs of Côte d'Ivoire, Marcel Amon-Tanoh alongside a Ministry delegation. 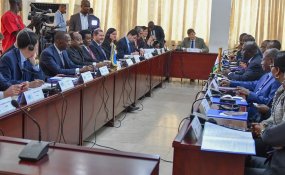 Members of the United Nations Security Council are on a mission to West Africa where they are reviewing strides made in peacebuilding by both Côte d'Ivoire and Guinea-Bissau. Arriving Thursday 14 February in the Ivoirian capital, Abidjan, Ambassador Anatolio Ndong Mba of Equatorial Guinea, Council President and co-lead of the mission along with Côte d'Ivoire, and the Council delegation, met with Foreign Minister Marcel Amon-Tanoh and Vice-President Daniel Kablan Duncan. The Council also participated in a roundtable on the transition from peacekeeping to peacebuilding with United Nations Resident Coordinators in Côte d'Ivoire and neighbouring Liberia. Côte d'Ivoire has been a non-permanent member of the UN Security Council since the beginning of 2018. The UN Operation in Côte d'Ivoire (UNOCI) closed in June 2017, after 13 years deployed in the country which was plunged into instability from 1999 to 2011. The end of UNOCI's mandate was hailed as a UN peacekeeping success. At a press conference on Friday, the Representative of Côte d'Ivoire to the UN and co-lead of the Council mission, Leon Kacou Adom, said the visit had provided an opportunity to exchange experiences and information, including on best practices on transitions from peacekeeping to peacebuilding, among representatives of Member States, Ivorian authorities and experts from UN country teams in Côte d'Ivoire and Liberia. "At a time when United Nations peacekeeping operations are at a crossroads, and in a context marked by the reform launched by Secretary-General António Guterres, it is clear that the Security Council, which is in charge of peacekeeping and international security, should highlight successful experiences in this regard, in this case in Côte d'Ivoire and Liberia," he stressed. Legislative elections are scheduled for March 10, 2019 in Guinea Bissau. They are to be followed by a presidential election whose date has not been set. During the visit, the delegation met with Prime Minister Aristides Gomes, UN Deputy Special Representative David McLachlan-Karr, as well as representatives of partner organizations involved in the peacebuilding process in Guinea Bissau, according to a Twitter post by the UN Department of Political Affairs and Peacebuilding. The delegation also met with the Speaker of the National Assembly, the leaders of political parties, the President of the National Electoral Commission, the President of the Supreme Court and representatives of civil society. It also met with President José Mario Vaz. After more meetings in Guinea-Bissau, the Council delegation will head back to New York later on Sunday 17 February.